Do you have a quirky and engaging story looking for a publisher? Yellow Brick Books accepts submissions for fun, quirky and engaging picture books and early readers. We accept manuscripts and illustrator portfolios through our website. We love hearing from first time, emerging and established writers and artists! Please note that we do not accept any submissions by email or post. Any submissions sent via these methods will not be assessed. While we do accept submissions from authors and illustrators outside of Australia, our current focus is on promoting artists who are Australian residents. 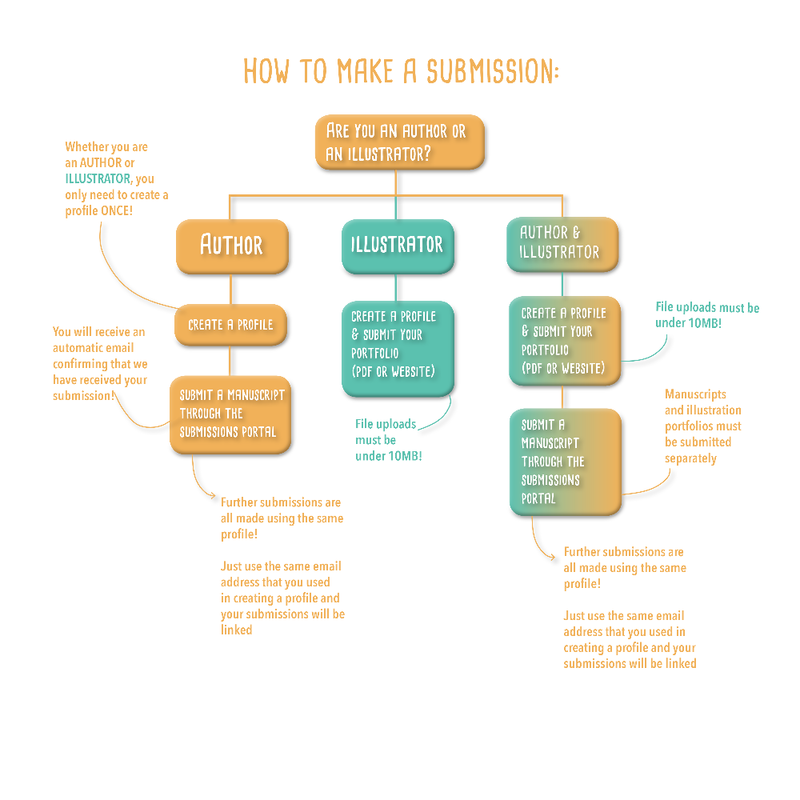 Please read the instructions for submission before creating a profile or submitting a manuscript. You can also refer to the chart below. Before submitting a manuscript start by creating your profile here. You only need to do this the first time you submit a manuscript. Once you have a profile you can submit a manuscript. You will receive an automatic confirmation email upon submission. Always use the email you used in creating your profile when submitting a manuscript. Unfortunately we are unable to provide feedback on individual submissions. We do respond to every submission we receive, but please be aware that it can take up to 6 months for a decision to be made. Submit your portfolio by creating a profile. When you create your profile you will be able to submit a PDF attachment. If this file exceeds 10MB, we would prefer a link to your website. We will keep the portfolios of suitable illustrators on file. Illustrators will be contacted about specific projects. If you do not receive an automatic confirmation email after creating your profile or submitting a manuscript, please contact info@yellowbrickbooks.com.au.